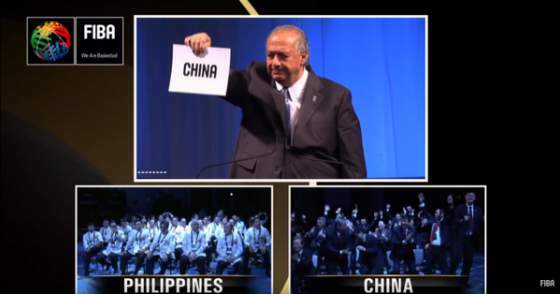 China to host 2019 FIBA Basketball World Cup, outbids Philippines - Balita Boss! The world basketball governing body, FIBA announced on Friday, August 7 that China will be the country to host the FIBA Basketball World Cup in 2019. This announcement was made afternoon after the host nation candidates, the Philippines and China, made their final pitches to the FIBA Central Board in Tokyo, Japan. During the presentation, China reportedly focus on their world-class facilities and hosting experience, while Philippines used their passion as their main selling point. The FIBA Central Board voted 14-7 in favor of China, according to a press release from FIBA. China will be hosting the Fiba Worlds for the first time after besting the Philippines in the bidding. "This was a very difficult decision because we had two national federations who did excellent work. However, there can only be one host country for our event in 2019 and it will be China. We would like to congratulate both national federations for their outstanding work and bids. This is what we wanted: to have national federations put together top quality bids to host our flagship event. We look forward to the 2019 FIBA Basketball World Cup, which will be the first of a new era with 140 teams competing during a 15-month qualification period to be among the 32 playing in China." Based on their presentation, China will host the 2019 FIBA Basketball World Cup in eight different venues in eight different cities: Beijing, Nanjing, Suzhou, Wuhan, Guangzhou, Shenzhen, Foshan and Dongguan. Yao Ming, the Ambassador for the China 2019 bid, headlined the Chinese delegation in Tokyo. China is also won the rights to host the 2022 Winter Olympics and being set to host the 2015 FIBA Asia Championship this coming September 23 to October 3, 2015 in Changsha, the capital city of Hunan Province. The Philippine delegation included Foreign Secretary Albert del Rosario, Pangilinan, Reyes, Alapag, Filipino boxing icon Manny Pacquiao and Filipino Hollywood actor Lou Diamond Phillips.